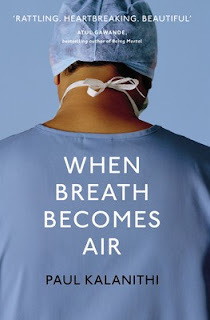 I first chanced upon the book, When Breath Becomes Air (by Paul Kalanithi) was a couple of months ago at the Kinokuniya Orchard. After browsing through a couple of pages, I've made up my mind that I will get hold of this book (or memoir) one day. Recently, I've gotten hold the book and finished reading it within 1.5 weeks. I must give myself a round of applause for this "mini achievement", you see, I am a slow reader and this is one of the book that took me shortest time to complete, from cover to cover. Of course, the key reason is that I was intrigued by the book from page one, a page turner as they called it, not by the mysterious events or twisted plots but by the beautiful recount of the last few years of the author (Paul Kalanithi passed away before finishing this memoir and his wife, Lucy, has to step in to finish it up on his behalf). Paul Kalanithi is a successful neurosurgeon, due to the terminal illness (lung cancer), he switched from the role of doctor to patient at the young age of 30+. Down but not out, he made his last few years count by writing this memoir (I would rather call it gift) for the world. He is teaching us how to live, from a dying soul! Even though the book contains quite a fair bit of medical lingo (because of his profession), but it makes me wanted to understand every single words written and finding out the meaning of the words is a joy in itself. If you can only read one book for the balance of the year, this is the book to pick. Highly recommended!